The last statistical publication that Speaking of Research will be reviewing in 2017 are that of Belgium. These will be added to both our worldwide animal research statistics page, and the new Historical animal research statistics page. In previous years, Belgium’s three regions (Brussels, Flanders and Wallonia) have published their statistics independently, but the Belgian Government is now collating these regional statistics themselves. 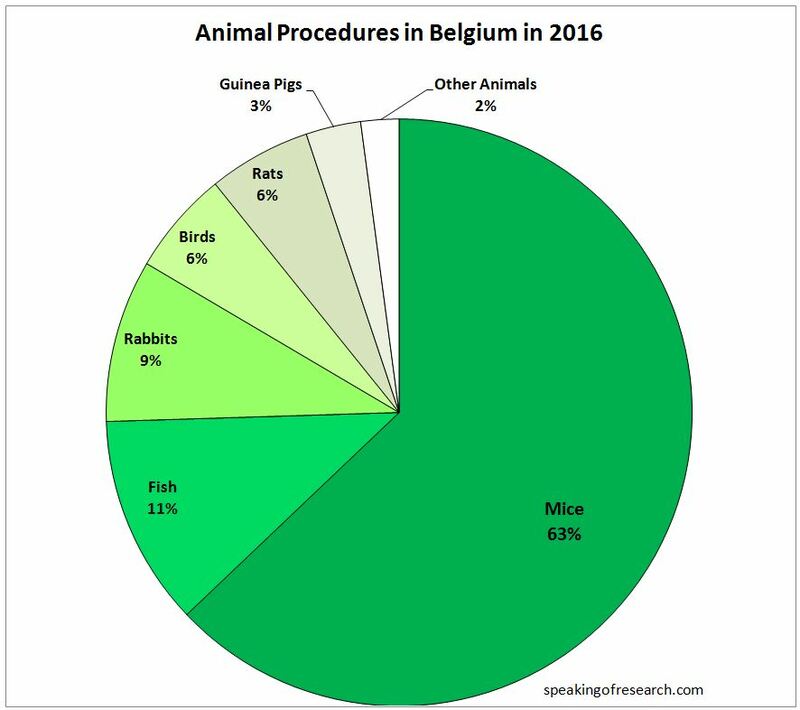 In 2016, according to the Department Omgeving, Belgium conducted 535,829 procedures on animals, down 5.4% from 2015. Most of the overall fall came from a 40% fall in the number of fish used, from over 100,00 down to just over 60,000 (a 39% fall). There were also falls in rats (11%) and guinea pigs (7%). There were rises in the use of rabbits (11%) and birds (37%), while mice – the most commonly used species – remained almost identical from the previous year. 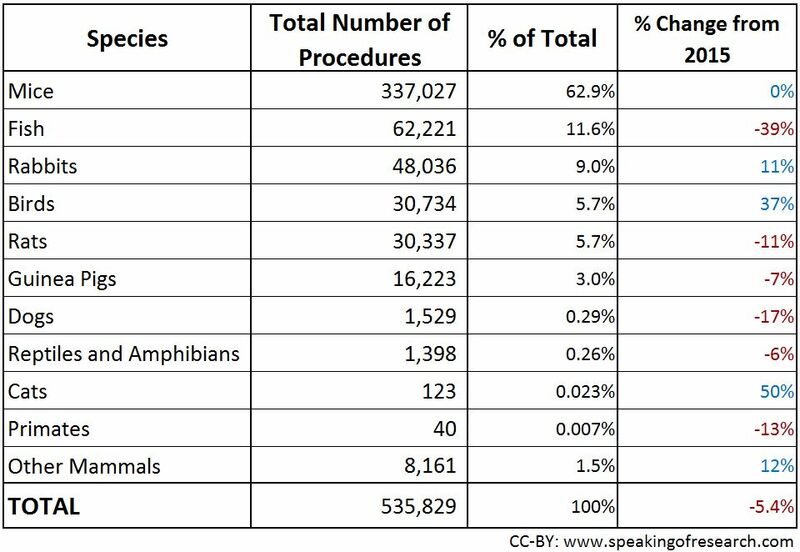 As in most countries, mice remain the most common species used (62% of all procedures), followed by fish (11%). rabbits (9%), birds (6%) and rats (6%). While mice, rats, birds and fish account together for 86% of all animals (common for many European countries), the proportion of rabbits is higher than in many other countries. Dogs, cats and primates together accounted for less than 0.4% of research, with only the number of cats rising from the previous year (from 82 to 123). 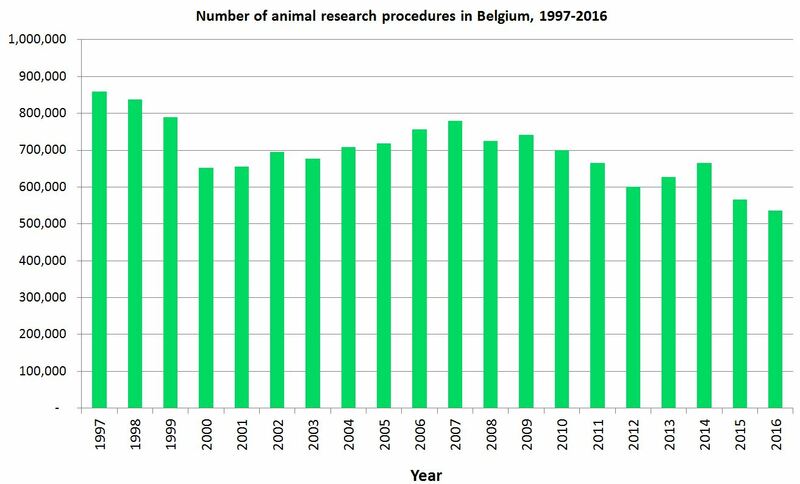 The number of animal procedures in Belgium has now fallen to its lowest point in the last two decades, down 38% from 1997. Retrospective reporting of severity showed that 60% were Mild or Non-Recovery (where the animal is anaesthetised and never woken up), 22% were Moderate, and 18% were considered Severe – a fairly high proportion compared with other European countries and possibly reflecting the amount of regulatory research. Basic Research was the most common use (53.0%) followed by Regulatyory and Routine productioin (24.8%), and Translational and Applied Research (19.8%). Posted on December 20, 2017 by EditorPosted in News, StatisticsTagged Belgian, belgium, statatistics, wallonia. Previous Previous post: Research Roundup: brain estrogen necessary for ovulation, breakthrough in treatment for Huntington’s disease and more! Next Next post: Research Roundup: gene therapy for inherited blindness, urea implicated as a major cause of dementia and more!